The Neurosurgery Department has been headed by Professor Marcos Tatagiba as its director for the past several years. 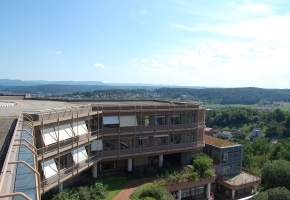 It is part of the traditional Tübingen University Hospital, which is located only 20 minutes by car from Stuttgart airport. Professor Tatagiba and his young and specialized team offer the whole range of treatment methods in neurosurgery. Our goals are to provide patient-oriented care, to study neurosurgical conditions and to develop new treatment techniques and modalities as well as to provide education and training for medical students and doctors. The difficult context of neurosurgical conditions requires treatment by specialized physicians. At our specialized out-patient clinics, you will find the right expert for your questions and problems. While we are continuously expanding, the number of neurosurgical interventions performed at our hospital each year has reached almost 3.000. This makes it one of the busiest neurosurgical departments in Germany. There are five operation rooms, soon to be equipped with intraoperative MRI (one of only a few devices in Europe), where surgical operations are carried out by an experienced team of surgeons, anesthesiologists, and nurses. Our dedicated and excellent neurosurgery intensive care team provides the best possible post-operative care at our own intensive care unit with 14 beds.For the benefit of our patients, we maintain intensive collaborations with neighboring disciplines such as anesthesiology; neuroradiology; neurology; ENT surgery; cardio-thoracic surgery, craniofacial surgery, ophthalmology, endocrinology, etc. Our services are subjected to permanent quality control. We are certified according to KTQ (collaboration for transparency and quality in hospitals), Oncocert (German Cancer Society) and the German Soceity for Continence. And recently we were elected as the first post-graduate training center of the World Federation of Neurosurgical Societies.